Tuscany is known to be one of the most beautiful places in Italy. Many a writer, film maker and tourist passing through the region have been charmed by the countryside where cute villages, monasteries and castles blend in perfectly in the rolling hills. At its heart is the beautiful Chianti Classico district, home to red wines from Sangiovese and a host of welcoming wineries. This guest post is written by wine consultant and sommelier Caroline Henry, who visited Chianti in October on a sponsored trip following the European Wine Bloggers Conference. It was Caroline’s first trip to the region and we are delighted that she could share her impressions here. The Chianti region is situated between Florence and Siena. The hillsides are a patchwork of oak, cypress, chestnut and pine forests, intermingled with vineyards and olive groves, splendid in their blazing autumn glory under the pleasant Tuscan sun. The region has a long and rich history dating back to the Etruscan and Roman times. In the Middle Ages, the area became the theatre for the fierce battles between the city-states of Siena and Florence. Around the same time it became a stronghold for the church which meant that several monasteries, fortresses and castles emerged all over the region. During the Renaissance, in times of peace, several of these buildings were converted to stately homes and villas and became wine and olive oil estates. Whilst visiting Chianti Classico, we learned that 13th century Chianti was a white wine blend of Malvasia and Trebbiano. However, over the centuries Chianti developed into a red wine based on the Sangiovese grape. Sangiovese often shows flavours of fresh black fruit – black currant, cherries and blackberry – with a hint of sweet liquorice and is characterised by a high acidity and chewy tannins which will soften with aging. Chianti Classico wines are from grapes grown on the original sites defined as far back a the 17th century and renowned as the best vineyard sites in the area. The Chianti Classico district compromises about 70,000 hectares (ha) of which only 10,000ha are vineyards and 8,000ha olive groves. We spent three days in the heartland of Chianti Classico between Gaiole and Greve starting our trip at the Santa Maria al Prato convent in Radda. Originally a Franciscan Monastery dating from the 14th century, it today hosts the ’Welcome Centre’ of the Chianti Classico Wine Consortium. It also has plenty of information on the different wineries to visit in the area and the history of Chianti. In 2012 a contemporary art centre will open on the 2nd floor with collections from all over the world. Radda, the capital of Chianti Classico, is a beautiful medieval walled town with a rich culinary history. A must try gastronomic specialty is Ribollita – a hearty soup made from left over bread, canelli beans and inexpensive vegetables such as black cabbage, carrots, onions and spinach. Next we visited the Badia a Coltibuono wine estate, a converted Abbey originally built by the Vallombrosan monks. The monks were known for having revolutionized the local agricultural practices and were among the first to plant Sangiovese here. The Abbey was secularized when Napoleon annexed Tuscany in 1810 and was acquired by Michele Giuntini. In the spirit of the monastery the Stucchi Prinetti family, current owners and ancestors of Guintini, have transformed the wine estate into a sustainable modern centre for food and wine appreciation. Besides the winery, Badia a Coltibuono also includes an Agriturismo, a cooking school offering one day and residential traditional Tuscan cooking classes and restaurant featuring live jazz or classical music during the summer. On the second day we visited the Castello di Brolio, an iconic castle in the history of Chianti. Built in the 11th century it was restructured by Baron Bettino Ricasoli, a prominent politician and the creator of the first known ‘Chianti recipe’ in 1872, proscribing 70% Sangiovese, 15% Canaiolo and 15% Malvasia Bianca. Today’s Chianti Classico wines are 80-100% Sangiovese and white varieties are no longer allowed. The castle has a small museum which hosts a centuries old collection of arms and armour of the Ricasoli family and gives a good insight in the political and agronomical work of Bettino Ricasoli. The castle grounds are stunning and in summer visitors can enjoy traditional Chianti fare and the Barone’s wines in the large garden of the Osteria dell Castello. Situated a little down the hill is the Barone Ricasoli tasting room and wine shop. Another wonderful place to visit is the Castello di Ama in Gaiole. The winery was established in 1972 and was taken over by Marco Pallanti in 1995. Of the 250ha which make up Castello di Ama 90ha are planted with vines (predominantly Sangiovese) and there are 40ha of olive groves. In 2000 Lorenza and Marco Pallanti started the ’Castello di Ama per l’Arte Contemporanea’ project in which they invite a prominent artist to live on the property for several months and create a permanent artistic installation. These artworks are dotted around the buildings and the land of Castello di Amo and are part of the guided winery visit. After indulging in modern art we were transported back to the Middle Ages visiting Vignamaggio Wine Estate. The oldest part of the Villa of Vignamaggio dates back to the 14th century, and legend has it that Leonardo da Vinci’s famous Mona Lisa was born here in 1479. It was also the place where a large part of Kenneth Branagh’s Much Ado about Nothing was filmed. The estate has been in the hands of the Gherardi family since the 16th century and they produce excellent Chianti Classico, Super Tuscans, Vin Santo and olive oil. The beautiful villa is also an Agriturismo and offers a wine tourism programme which includes guided walks, tastings and wine dinners. We ended the day with a fabulous ‘Whole Steer Dinner’ at Solociccia in Panzano. Solociccia is the brain child of butcher-poet Dario Cecchini, also owner of the Antica Macelleria Cecchini, his butcher shop across the street. Dario’s aim is to respect the animal by using every part in the best possible way. 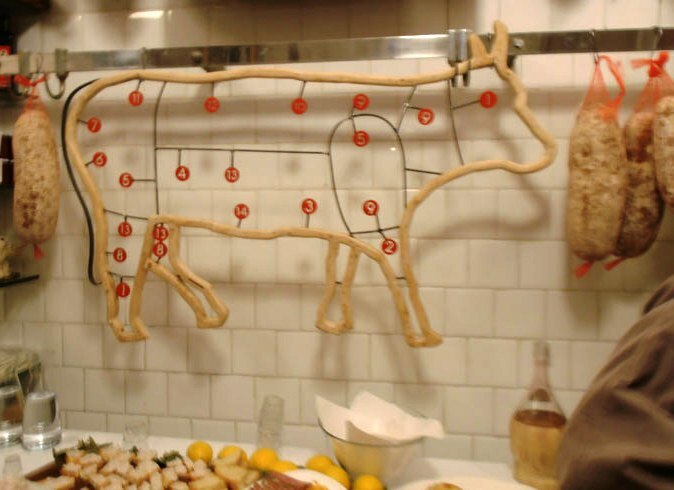 At Solociccia guests eat a set menu of ’butcher foods’ at a communal table in a convivial atmosphere. The menu consists of six meat courses served with seasonal vegetables and the traditional Tuscan white beans with olive oil and bread. After that there is cake and coffee. A quarter litre of house wine and a grappa are also included in the amazing value menu price of €30. On our last day we first visited Caparsa, a small winery near Radda. It is owned by artisan winemaker Paolo Cianferoni who farms organically and makes wine in a ’natural’ way. Caparsa offers a 45 minute guided cellar and wine tasting tour which can be booked via their website. We concluded our tour of Chianti Classico at the Castello d’Albola wine estate and the beautiful Villa Marangole with its magnificent views from the large terrace. The villa is available for holiday rentals and it sleeps up to 12 people. Two kilometres up the hill lies the Castello d’Albola, a 15th century fortress which today houses the winery, tasting room and cellars of the Castello d’Albola wines with daily guided tasting tours of their wines and olive oil. Chianti has a rich culinary history and the various Chianti Classico producers we met emphasized that the wines are made to be enjoyed with local food – it enriches the experience as the different flavours really enhance each other. It is a Tuscan tradition to drink Vin Santo at the end of a meal when guests are visiting. Vin Santo is an elegant dessert wine made from dried Malvasia and Trebbiano grapes, which are then slowly fermented and aged for at least three years in small casks. It has rich flavours of apricot, peach and nuts and is often accompanied by some biscotti. A glass of Vin Santo and a biscotti are the perfect way to end a great meal among friends, and it was the perfect way to end our trip. Caroline would like to thank the Consorzio Vino Chianti Classico for their generous sponsorship of this trip and the European Wine Bloggers Conference for making it possible. For more information, take a look at our very comprehensive Wine Travel Guide Between San Gimignano and Siena written by wine writer Michele Shah, who lives in Florence. Gift Membership to the website giving one-year access to download all the latest PDF Guides makes an unusual present. Until the end of the year we are pleased to offer a 30% discount off annual membership to readers of this blog who use the code D2BLG1111. 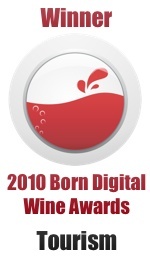 This entry was posted on Tuesday, November 22nd, 2011 at 12:00 pm and is filed under Vineyard Visits. You can follow any responses to this entry through the RSS 2.0 feed. Both comments and pings are currently closed. This is a great article. I wish that I had seen this before I made my trip to Italy. Like other dumb tourists, I only spent time in Rome. Obviously I need to return and do things right. Do go back and soak up all the beauty Tuscany and Chianti have to offer!! Glad you liked the article! you have here on this post. I might be coming back to your blog for more soon. Thanks Elle, I am happy you enjoyed the article! Do check the site again as it’s full of very useful information! If there is one trip a year that I can take it would definitely be to Italy. Thanks for sharing this information about Chianti, I will definitely spend a couple of day there next time I go there. Chris you are absolutely right about Italy being a wonderful place for a holiday. Do visit Chianti if you can, it is one of the most beautiful wine regions I have ever visited!